The best scenes in Clint Eastwood’s American Sniper, an adaptation of a memoir by Navy SEAL sniper Chris Kyle about his life and service in the Iraq War, illustrate how small the world has gotten without really erasing the distance between two points. In one, Kyle (Bradley Cooper) talks to his wife Taya (Sienna Miller) on a satellite phone. When a firefight breaks out around him, the dropped phone allows her to hear the gunfire but leaves her powerless to help, or figure out whether her husband is dead or alive. In another scene, Chris, at home between tours of duty, talks to Taya about the absurdity of being home and shopping among people who don’t want to talk about the war, when his head is still back in Iraq with his fellow soldiers. What used to be normal now feels unreal. Between joining the Navy in 1999 and his discharge 10 years later, Kyle saw four tours of duty in Iraq, racking up 160 confirmed kills. Kyle died in 2013 alongside a friend, killed by a troubled Marine on a Texas shooting range during an outing where they were said be helping him readjust to civilian life. Between his military career and his death, Kyle became well-known through his book and his public appearances, displaying a gift for telling stories that expanded the fame he earned on the battlefield beyond his fellow soldiers, while also raising some questions about their veracity. Jason Hall’s screenplay never addresses the latter issue, adopting an uncomplicated print-the-legend attitude toward Kyle, who’s portrayed as unfailingly kind, humble, and courageous, if prone to the occasional funk. 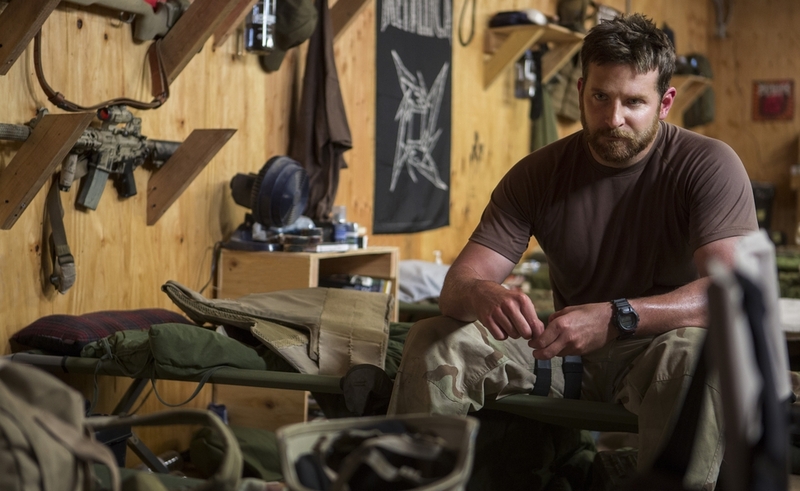 A lesser filmmaker, and a lesser actor, might have made American Sniper into an unthinking bit of jingoism. Eastwood and Cooper keep finding respectful complexities in Kyle’s story, until the film reveals itself as too simple to have much use for them. Violence has never been a simple matter for Eastwood, whose films are often both fascinated and repulsed by it, from the way a thrill killer brings out the monster inside a cop in Dirty Harry to the lapsed reformation of William Munny in Unforgiven to the self-sacrificing finale of Gran Torino. Eastwood’s often treated war with weariness as well, particularly in the companion films Flags Of Our Fathers and Letters From Iwo Jima, which offered perspectives on a famous World War II battle, and the cost to those who fought it, from both sides of enemy lines. American Sniper opens with a sequence seemingly designed to express the same uneasiness with Kyle’s task, beginning with his first combat assignment, one that found him forced to kill a mother and her child to prevent a suicide attack. The scene ends with a boy in the crosshairs before flashing back to Kyle’s own childhood in Texas, a cut that erases time, distance, and difference in culture as it shifts from one boy to another. Almost from the moment he arrives, Kyle has to reckon with Mustafa (Sammy Sheik), a silent, supervillain-like enemy sniper with skills to rival his own who, in one scene, is shown preparing to leave his wife and newborn child as he heads into battle. They’re both men with families to protect. The parallels more or less end there, however. Kyle never stops referring to Iraqis—enemies and otherwise—as savages, and the film presents them as such, a mostly undifferentiated mass of anger out for American blood. Cooper’s performance keeps undercutting the bravado, though. The actor, who also served as one of the film’s producers, bulked up considerably for the role. He looks little like the nervous, stringy-haired character he played in American Hustle, but the muscle does nothing to obscure his expressive eyes, which suggest uncertainty even as he takes aim at another target. He’s believable both in scenes that capture Kyle’s acumen in battle and in which he has trouble adjusting to life back home. As effective as these scenes are are, however, they’re a hollow achievement. Eastwood flirts with the idea of exploring the toll Kyle’s time in hell takes on him, but then backs away as the gunfire and the talk of duty overwhelm more tender human feelings. It’s ultimately a film about putting a kid in crosshairs, pulling the trigger, and learning not only to live with that action, but to live without regret. Is that possible? In the end, American Sniper doesn’t really care. It’s hard not to leave all that chaos with an admiration for Kyle’s heroism, but just as hard to not feel like Eastwood missed a chance to make a more substantial film about the man’s experience, the experiences of all the others who volunteer for duties most would do anything to avoid, and what it’s like to come back from it all to resume the life they fought to protect.